Manitoba First Nations Education Resource Centre Inc. (MFNERC) has created a visual identity program. 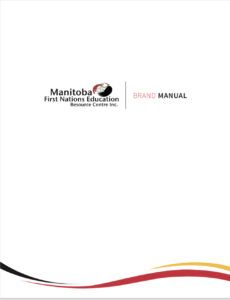 The brand manual will provide guidance and direction, from concept to creation, when developing communications, ultimately ensuring all marketing and promotional materials favourably and accurately reflect MFNERC’s high production standards for the benefit of First Nations people. Please follow these guidelines, to ensure and maintain a focused, positive image of the Resource Centre. The Publishing & Communications Unit is responsible for identifying incorrect use and will work with all departments to bring applications of our brand into compliance with the identity program. In addition, they have the right to stop production of any application that uses the MFNERC brand incorrectly, or to require an application to be revised. The MFNERC logo is freely available for media use or to fairly depict the MFNERC. Misleading or fraudulent use is strictly prohibited. Please contact the Publishing & Communications Unit with any questions, for approval of particular uses, or for specific files types and sizes. Unit identifiers are available upon request.